It might be by default, but this is the best FL Studio controller money can buy. A must-try for longtime users - despite some limitations. It’s a proper FL Studio controller! Bearing in mind its enduring popularity with beat-makers and laptop musicians, it’s a little surprising that we’ve never had a dedicated hardware controller for FL Studio until now. Perhaps the reason behind this is that, with its multiple views and long list of plugin tools, FL Studio isn’t the easiest DAW to pair with a single set of hardware controls. In light of this, it seems like a smart move on Akai’s part to focus Fire - its debut FL controller - on a few core areas of the software, rather than attempting to do everything from a single device. 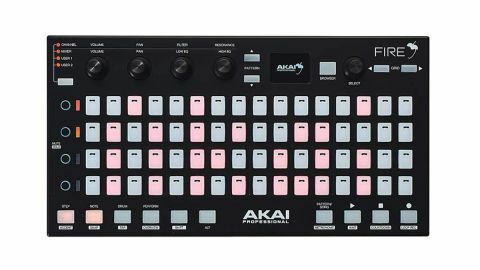 In terms of look and quality, the hardware itself is fairly reminiscent of Akai’s APC controllers for Ableton Live. As with those devices, the build is lightweight and clearly designed with affordability in mind, but still feels robust and well-made. Where the APCs took their layout cues from Live’s clip launcher, Fire is clearly built to resemble the step sequencer element of FL’s Channel Rack. Fire functions in four modes, each controlling a different section of the FL Studio workflow, although the emphasis is on sequencing and performing rather than mixing or sound design. These modes are Step, Note, Drum and Perform and allow the controller’s 4x16 pad grid to take control over the sequencer, the piano roll, the MPC-style FPC sampler and the playlist’s Performance Mode respectively. Of these, the step sequencer is the best served, given how well the hardware design matches that of the software. FL’s Channel Rack has always owed a debt to classic hardware so it makes sense to bring its interface out of the box. The finger drumming-focused Drum mode is less successful. The Fire’s pads are small, and can feel fiddly for precise playing. In this mode the left-hand 4x4 block of pads is used to trigger FPC’s sample tracks, but this leaves the remaining 24 pads unused. As a result Drum mode feels cramped and doesn’t make use of much of the control surface. Compared to controllers such as Push or Maschine, Fire lacks access to features like quantise settings or beat repeats/rolls, leaving Drum mode feeling a little shallow. Fire’s pads are velocity sensitive, but there are only two velocity levels available - for standard or accented notes. This is limiting, but given the smaller pads it’d be hard to be very precise anyway. Note velocity, pitch and length, can be edited easily using the four rotaries along the top, though this isn’t labelled on Fire’s interface. These can also control basic channel and mixer parameters. Fire isn’t an all-encompassing DAW controller, and has its weak points, but it’s still great to have a proper FL-focused MIDI controller. The ability to chain up to four units is a nice touch too, letting those who want more expansive control create a single, multi-unit control surface. Given the reasonable price, and its lack of rivals, this is a bit of a no-brainer for longtime FL users, despite any limitations.